Although of the various hazards possibly prevalent in foods of animal origin, those of a biological nature are likely to result in the highest short-term risk for the health of the consumer, chemical hazards are generally perceived by the public as representing the top safety issue. The various food safety agencies around the world rely on formal risk analysis to determine which chemical hazards indeed represent risks (‘risk assessment’) and which measures should be taken to prevent this from happening (‘risk management’). In chemical risk assessment, various potentially toxic effects resulting from exposure to a particular identiﬁed hazard are characterised. These include those of a carcinogenic nature, but also genetic, teratogenic, photosensitisation, neurological, dermatologic, immunological, reproductive or other toxic effects need to be considered. In 25 chapters the various chemical hazards - 'avoidable' or 'unavoidable' and possibly prevailing in major foods of animal origin [muscle foods (including fish), milk and dairy, eggs, honey] - are identified and characterised, the public health risks associated with the ingestion of animal food products that may be contaminated with such xenobiotic chemical substances are discussed in detail, and options for risk mitigation are presented. 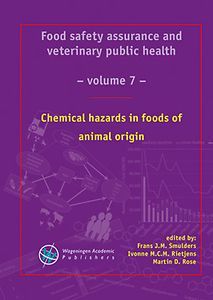 This volume targets an audience with both an industry and academic background, and particularly those professionals who are (or students who aspire to become) involved in risk management of foods of animal origin.